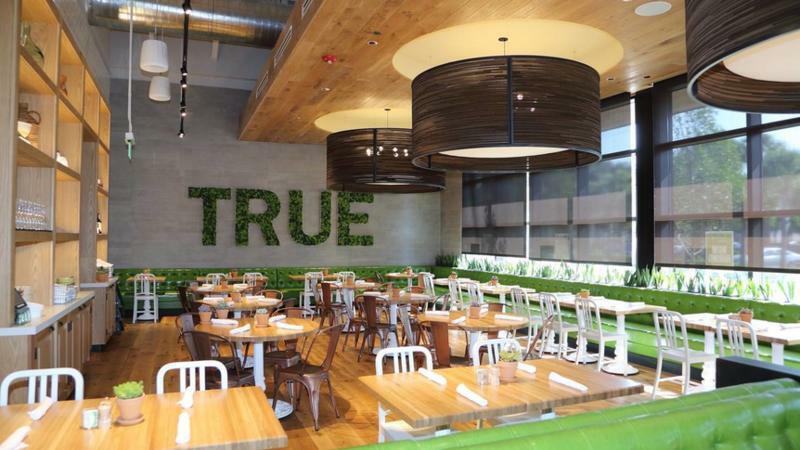 This True Food Kitchen opened in February in Boca Raton. Phoenix-based True Food Kitchen applied to the city for a $1.8 million interior and exterior conversion of the former Mitchell’s Fish Market at the St. Johns Town Center. The permit calls for Phoenix-based True Food Kitchen to renovate the 7,540-square-foot free-standing restaurant along with 1,064 square feet of exterior space, according to our Daily Record news partner. Wolford Retail Builders Inc. of Tampa is the contractor and Aria Architect of Oak Park, Illinois, is the architect. True Food Kitchen has not confirmed a timeline for the restaurant, planned at 5205 Big Island Drive. Simon Property Group is an owner and the manager of St. Johns Town Center. “We’re working on solidifying an agreement with Simon, but it hasn’t been formalized yet,” said Vice President of Marketing Shannon Keller in March. True Food Kitchen, with 26 locations in 12 states, calls itself “a health-driven, seasonal restaurant” with a bar and an open kitchen. It was developed with alternative medicine celebrity doctor Andrew Weil. The city also has been reviewing plans to demolish interior and some exterior space at the 11-year-old restaurant at a cost of $25,000. You can reach a longer version of this story that includes a look at the True Food Kitchen menu on the Daily Record’s website.